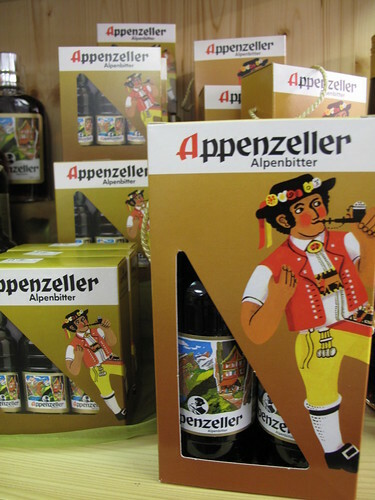 MyKugelhopf » Blog Archive » Welcome to Appenzell – Heads Up ! 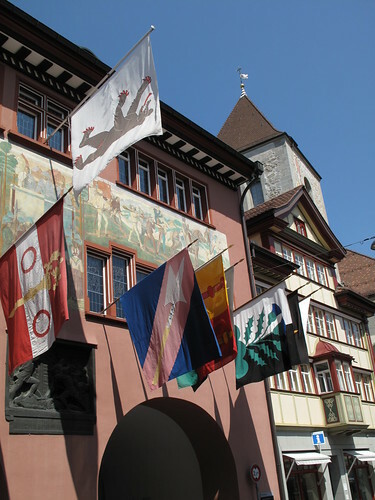 Welcome to Appenzell – Heads Up ! 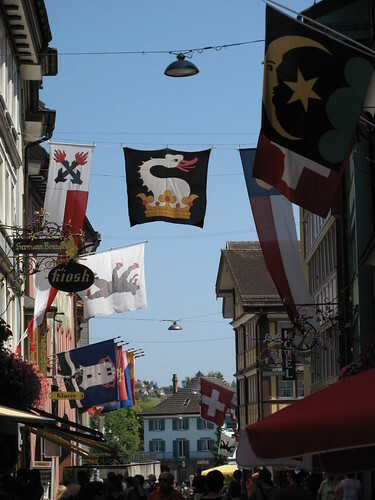 With family visiting us from France for a few days, we wanted to pick a destination that was as Swiss as we could find. 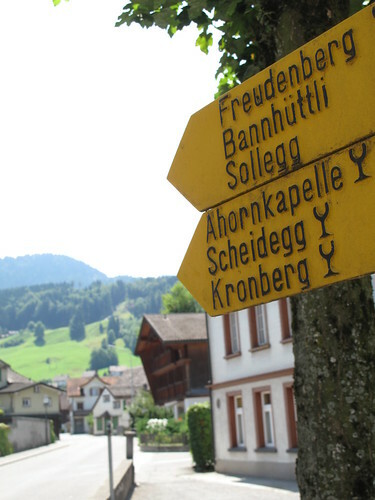 During our past year in Zürich, talking to locals and travelers and reading about the different regions in Switzerland, all signs pointed to Appenzell. 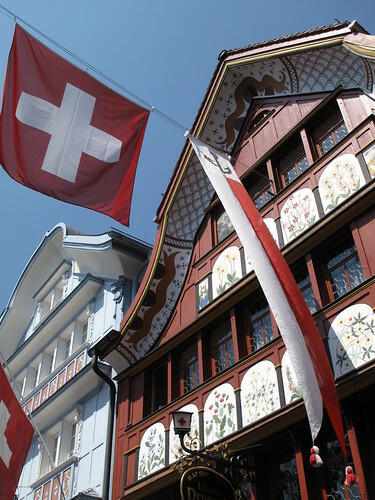 Narrow, picturesque streets, delicious Swiss delicacies, mountains in the background and a traditional way of life. Just south of St Gallen, near our Brunch on the Farm for the National Day, we found ourselves looking up at pure green, rolling hills, undulating into the distance with grazing cows, farm stands, barns and only tractors on the roads. 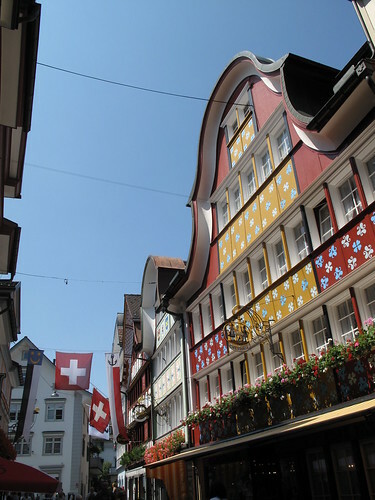 The tiny town of Appenzell was set against this scenery, just as beautiful with its painted houses, decorative facades and abundance of colorful Swiss flags seemingly filling the streets. 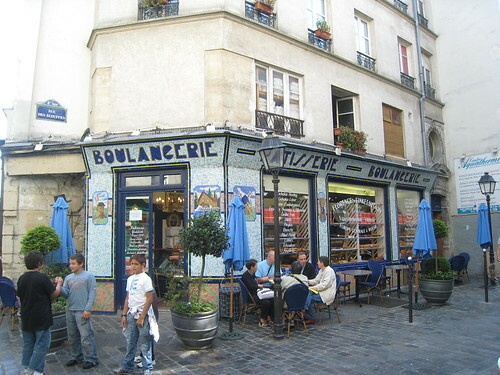 As you walk the streets in the center of town, you’ll be tempted to pop your head into each door. 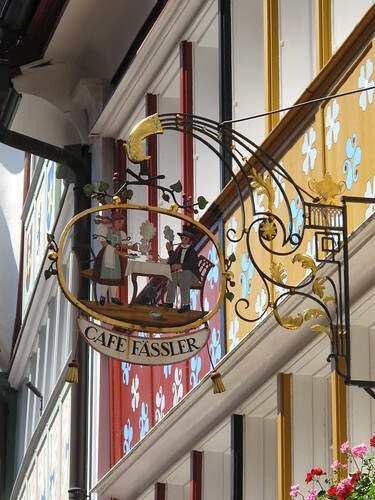 Cafés, pastry shops, butchers and stores selling Swiss objects like cow bells, tin milk jugs and wooden souvenirs. You definitely should do that. But then you should walk these same streets again – and just look UP. Admire the intricate artwork on each house, look at the shapes and details on the windows, the flower beds and the patchwork of colorful paintings on each panel. 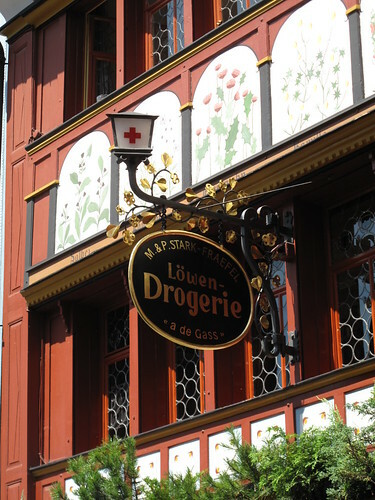 The signs at each address are an attraction in themselves, with a tool or other symbol showing you what the specialty is. Once you’ve worked up an appetite with all this photogenic scenery, it’s time to savor Appenzell’s other attractions – its gastronomy! 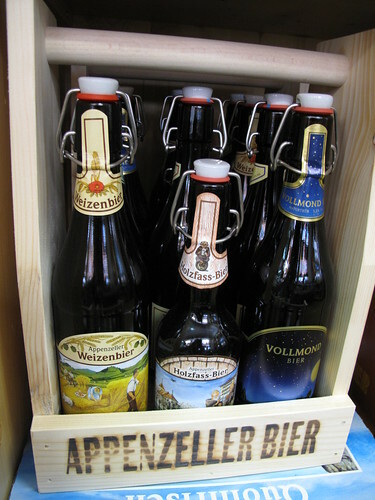 I loved the packaging and labels on the beer bottles and spirits, as you’ll see below. But best of all… the cheese, of course! And stinky cheese at that – after all, its logo is “the spiciest cheese from Switzerland.” You’ll be able to taste the different varieties of Appenzeller, as there are several. The three most popular are Classic, Surchoix and Extra (in order of increasing degree of maturity), with different colored labels to differentiate them. 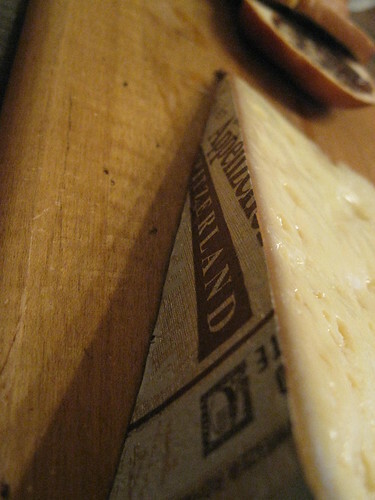 The longer the cheese ages, the stronger it gets. Whichever you choose, be sure to have it vacuum-sealed, or you’ll regret it in the car/train ride home! We also tasted an Appenzeller with 1/4 the amount of fat, which was surprisingly good. 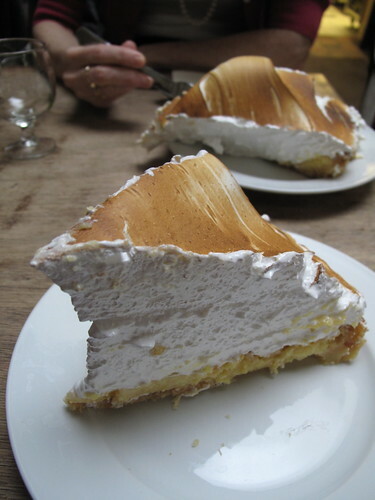 This was actually my French mother-in-law’s favorite of the bunch- a woman who considers using only half a gallon of cream and only half a package of butter in a dish as “light”! That’s to say that this cheese is by all means, not a selection for purely dietetic reasons!! It had a pleasantly dry texture and a salty component to it. 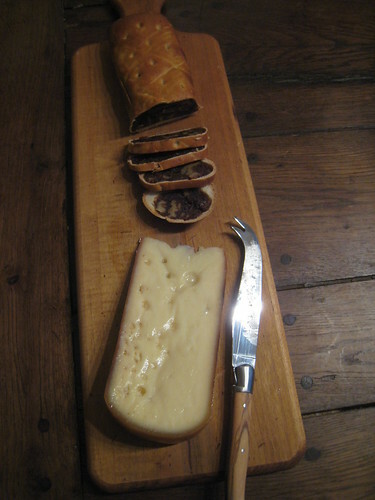 Excellent with another specialty of Appenzell, Birnebrot (pear bread). 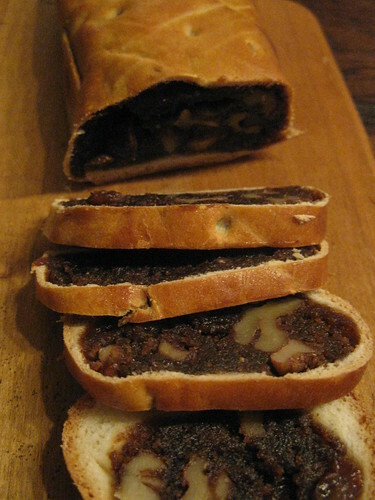 This is a dense and very moist bread, filled with pears, figs, walnuts and fruit brandy. 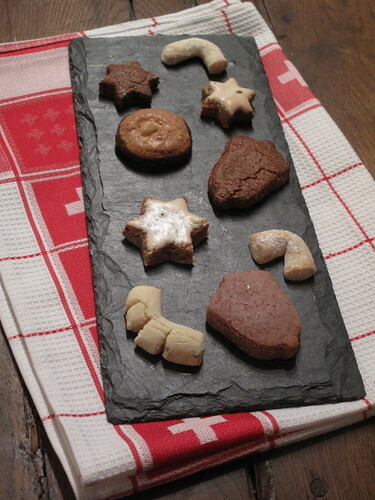 The spices were reminiscent of Christmas, snacking on gingerbread and sipping mulled wine. I loved it, and enjoyed many slices even without cheese. My mother-in-law joined me, but slathered butter on hers! Not a bad recommendation in fact! For those of you in Zürich, you can find excellent Birnebrot at Globus and Vollenweider, and probably at Migros and Coop too. 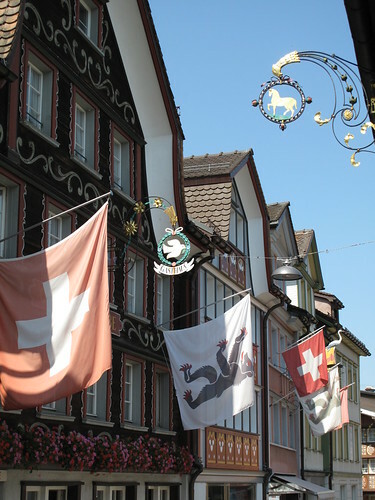 I highly recommend a visit to the town of Appenzell and the surrounding area. Perfect for hikes, picnics and just a stroll around the town – with your head up, of course. If you go this weekend, you’ll be there for the traditional folk music festival, Ländlerfest, which starts today. If not, I’ll meet you there next year for Ländlerfest 2010 ! All the varieties of cheese, local food products and other souvenirs. Another great address for cheese, beer, spirits and chocolate too! 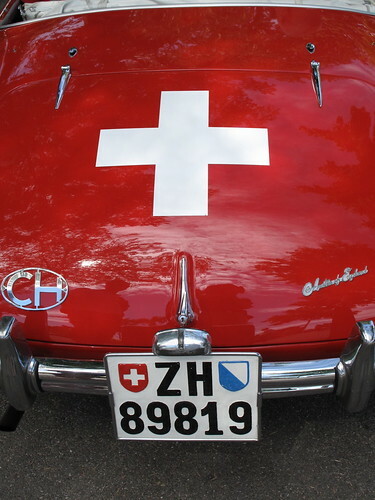 All the Swiss souvenirs you could ask for. Now I wanna book my ticket today. What a lovely town! It looks like you have been walking in the living museum of building arts. Lovely lovely building and detail on each one of them. And the pastry and the food.. oh… Who can resist the animal shape meringes? Oh my….I just adore the town! All the flags and decorations on the buildings look as if it is a photo of something we all imagine but it is real! 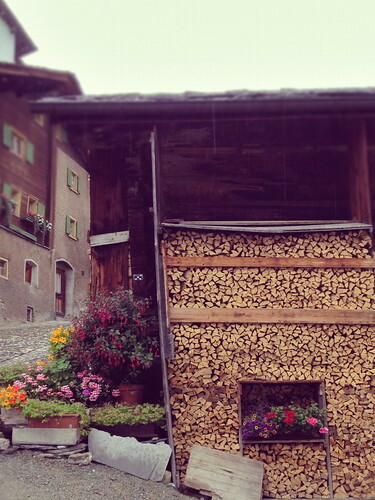 Switzerland really is so gorgeous….natural and colorful. I would love to visit your lovely little town but with your photos I don’t need too….but want to. I can almost taste the bread and smell the cheese. My favorite duo! The photography is fantastic….your writing expressing what you saw was just perfect. Thanks! This sounds like an absolutely lovely place to be! The cheese sounds really interesting, I don’t normally associate “stinky” with any Swiss cheese, I’ll have to try some. Great pics too! 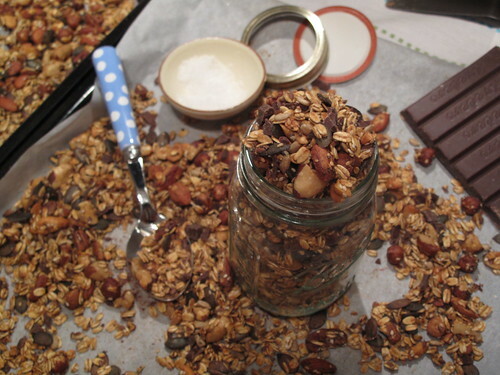 such a lovely tastey snipit of your world, Kerrin. thanks for sharing! oh wow! Thanks for the picture tour…I feel like I’m right there! 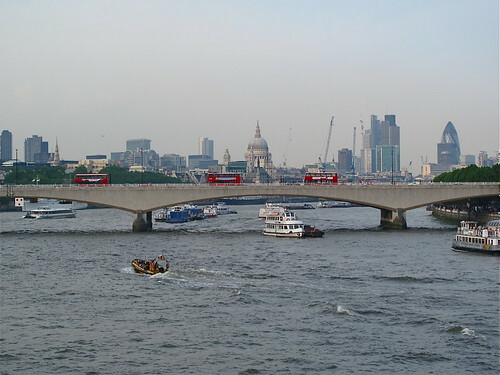 I am seriously hit by a case of wanderlust right now…Can’t wait to visit for myself! And that pear bread is GORGEOUS! Low-fat Appenzeller – now THERE’s a smart invention! 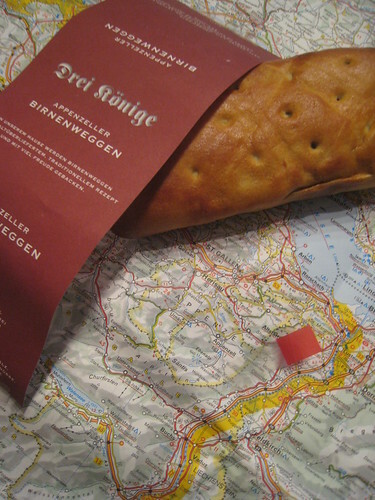 I’ll have to snoop around Geneva to see if the Röstigraben (Rösti Curtain) is as thick as they say – you don’t often find specialties from the German part of Switzerland here, and that cheese/birnebrot combo looks mighty fetching. Gorgeous town, and your gorgeous pictures put me right there. All those colors made me think of Colmar. Is this sort of a Swiss version of Colmar? I hope there’s a gym in town… to work off all those wonderful calories. Thanks for the tour. Thanks for making your blog so appealing and so refreshing, always. 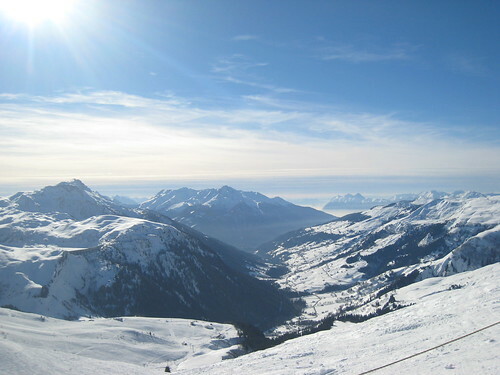 Switzerland was my “image” of Europe when I was young. 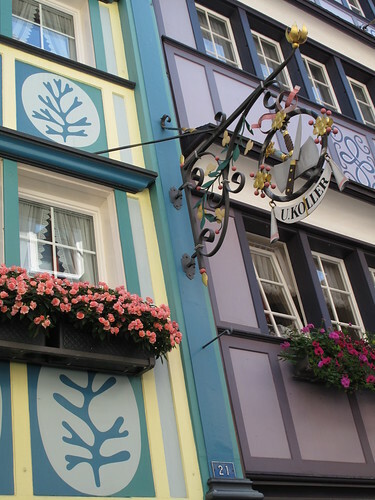 Medieval-style timber houses, flags, wrought-iron signs, the green countryside, picnic on the rolling hills…Wowza!! 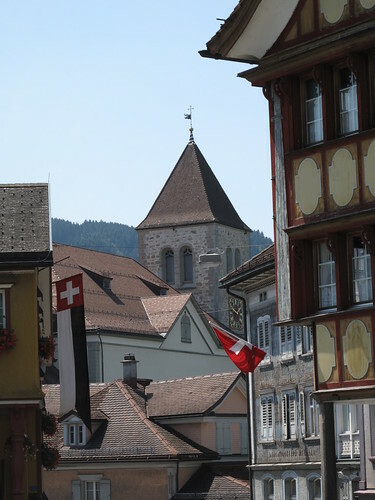 Hi everyone – so glad you all loved the photos of Appenzell, and felt like you were there with me. Hope you enjoyed the trip !! That’s what I always try to do … bring you all along on my travels !! Aprille, glad you love the post – but yes, I suppose I do provide a bit of temptation here … sorry! Chantal, thanks so much for the recommendation. I’ll check out your link for Teufen for sure! And then – perfect excuse to get back to Appenzell ! 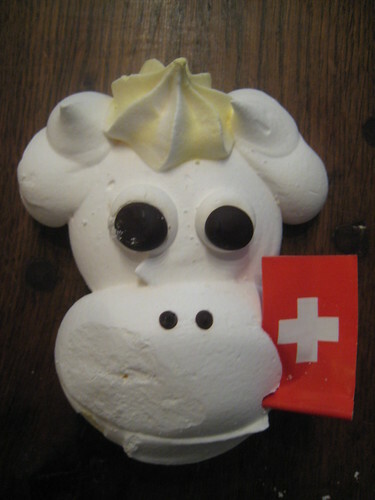 Scribetrotter, I have to admit – when I saw low-fat Appenzeller, I was quite shocked myself! Definitely let us know if you find this stuff in Geneva. I hear you about the famous Rosti Wall. 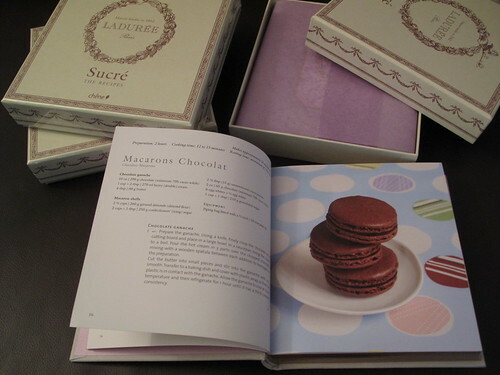 I bet there are plenty of French Swiss specialties I am missing out on too. Andrea, thanks for the fantastic comment !! Welcome back, hope you enjoyed your trip for sure. 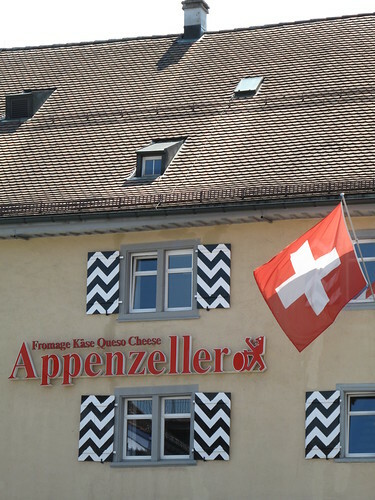 As a cheese lover, yes Appenzell is definitely for you! So cool that you have a girolle – I have yet to try Tete de Moine. 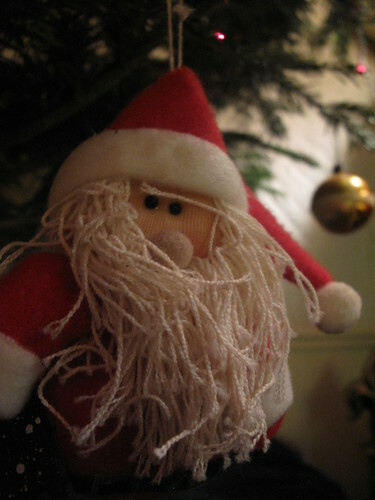 But of course, it’s on my list…! This is great and so timely. 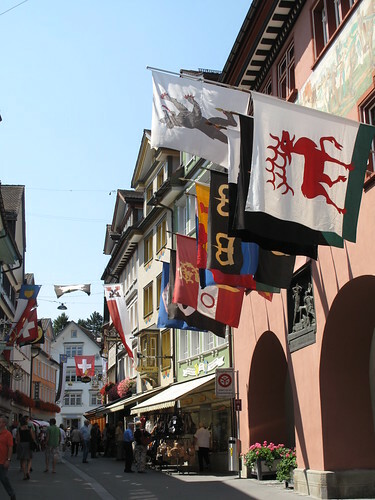 My family is coming in Sept and I thougth about taking them to Appenzell for the exact same reasons – so typically Swiss, good food, close to Zürich. I am definately including it in the agenda now! Thanks. By the way, I have to tell you…. your pictures take forever to load. I also talked with another person that reads my blog and they said they found mind through your site – but that they too had an issue with the images on your site loading very slow. Might want to look into that… Best, Jessica. Jessica, perfect for your family’s visit next month. And see Chantal’s suggestion above too while you’re in that area. Also, thanks for the heads up about the photos, I’m real sorry (and frustrated) to hear that. I will definitely look into that – and pronto!! I just wanted to let you know that I have come back to read this post again, because I fell in love with it. Let us know what you think after your trip !